Last issue in our story of Simon Newcombe, William Turrel and Mr. H. S. Scudder's trip to St. Paul in a Cart-Train we left them crossing a river. Safely across they continued their winding course through Minnesota. Each driver had two to three carts to look after. To keep them in line the second ox was attached by a leather thong to the tail of the first cart; and the third ox would be fastened in like manner to the second Red River cart. 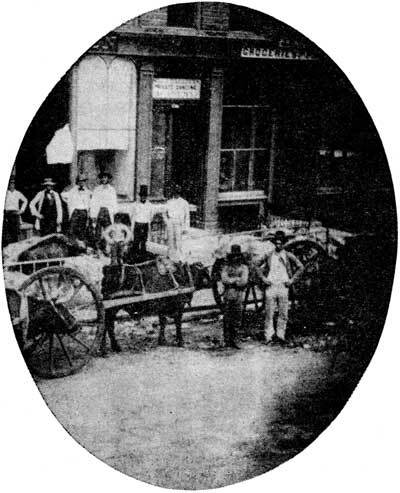 Red River Traders in St. Paul, 1860. Dr. John Schultz, one of the owners of the cart-train, left us an account of the best way to ride in a Red River cart, and no doubt gave the same advice to the travellers - and by this time they had discovered that Dr. Schultz's advice was well worth following. "Attempt to ride in it as one would in any civilized vehicle," said Doctor Schultz, "and one would find himself, to the musical accompaniment of frying pan and tin kettle, trying alternately to preserve himself from being pitched on the pony or ox, from having his right or left ribs cracked against the side rail, or from turning a somersault over the tailboard of the cart. There is only one way to ride a cart with ease," the Doctor continued, "and that is seated in front on its floor with one's legs dangling down near the animal's tail." But on with our cart-train squeaking through Minnesota. Before it reached the Mississippi River, the buffalo calf that Mr. Scudder was taking home died, but he made the best of his bad luck. If he couldn't have the buffalo for a specimen, he could at least take home the bones. So, while the cart-train travelled, he dismembered the bones and put them in a barrel to preserve them so that he could eventually wire them together. "The ferry-boat was small and only two Red River carts could be accommodated at once. Sandin, the clown-cook, had two carts in his charge; one contained bales of pelts, the other the food, cooking utensils, and the barrel containing the bones of the buffalo calf. Sandin's front cart-ox was a wild creature. When he drove onto the ferry-boat, he did not stop, but leaped headlong into the deep river, pulling after him not only his own cart, but also the hinder ox and cart, attached to the tail of his cart by a raw-hide thong. Everything was upset, and down the Mississippi, floated no end of boxes, fur bales, pails, kegs, barrels, and oxen and now empty carts. The oxen were finally rescued a mile down stream." In the meantime, Sandin had jumped into a dug-out canoe. Now he was all cook, forgetting he'd ever been a clown. He first rescued his cooking pots and kettles, then the food, and finally the furs. Scudder shouted at him to rescue his precious buffalo bones, Mr. McKinney shouted at him to rescue the valuable furs, and the ladies looked sadly at the soaked biscuits, tea and sugar. This adventure resulted in a day in camp. The valuable furs had to be spread out and dried. The soaked biscuits, tea, sugar and other edibles also had to be spread out in the sun. "At every meal thereafter," remarked Mr. Scudder, "the insipid soaked food reminded us of the FATHER OF WATERS" - another name given to the Mississippi River. As the cart-train continued on its way they saw little wild game, and no wonder as the squeaking train would give plenty of warning to seek cover. But they did see a bear, deer, prairie chickens, ducks and sand-hill cranes. They bemoaned the fact that they had just missed seeing a gathering of two thousand Indians who had assembled to make a Treaty with the American government. Still they met a few Indians with picturesque names. Among the most notable were Buffalo, and Mrs., and Miss Buffalo, with General Paterson, and Hole-in-the-day, who were riding in a buggy. Riding in a buggy in comfort! And they were riding in a cart! By the time the cart-train reached St. Cloud, the travellers were heartily weary of carts. So after one more day's riding, they got impatient, and some of them walked the rest of the way to St. Paul; others took a stage. They arrived a day ahead of the cart-train - which had been twenty-two days travelling the five hundred miles from Fort Garry. What a relief, thought the scientist, who had gone to the Saskatchewan River to observe the total eclipse of the sun. And no wonder! From the time they had left St. Paul on June 16th, 1860, and returned to it on Sept. 13th ... they had travelled by pioneer transportation, a distance of thirty-five hundred miles.